Have you tried kombucha yet? It’s kind of like soda, ice tea, and ginger ale are having a party in your mouth. And…if you brew homemade kombucha yourself, you can be sure that all the ingredients are high-quality while also saving money and having some fun! Check out these instructions about how to brew your own kombucha (and don’t forget to grab your free printable cheat sheet!). Why Brew Your Own Organic Kombucha? One drawback to kombucha is the price. It can be anywhere from $4 – $8 a bottle in my neck of the woods. I’m sure it’s even more in the big city. Fortunately, it’s easy to brew at home! Homemade kombucha is delicious. As usual, the homemade stuff is just yummier, feels healthier, and is much more “real” somehow. You know exactly what’s in your own homemade kombucha, as well as the quality of each ingredient. That is empowering. The jar of homemade kombucha brewing on your countertop will also be a conversation starter with anyone who hasn’t seen a SCOBY before! The measurements in this homemade kombucha recipe are in Imperial, as many brewing jars are in gallons. Even here in Canada, most people are familiar with measuring liquids in cups rather than mL. When I try to think about Imperial, I just remember that my mom calls a 4 litre jug of milk “a gallon of milk”. This helps me visualize the volume until I can get to my iPhone and do the unit conversions. Approximately 1 cup of raw organic kombucha from previous batch (can be store-bought kombucha). Clear, clean, and sanitize your workspace (countertop, sink, et cetera). Cleanliness during Kombucha brewing is SUPER important. Germs + kombucha = yucky. Sanitize all supplies in the dishwasher on the sanitize setting. Boil the filtered water in a large pot. Add the tea bags and sugar to the boiled water. Stir until the sugar is dissolved. Allow tea to cool (cover if it will be left unattended to keep out fruit flies). Remove tea bags and any bits of tea leaves that have escaped the bags. Transfer the cool sweet tea to the 1 gallon glass brewing jar. Pour in the existing kombucha liquid that accompanied the scoby. Place the scoby in the jar (use your hands, just make sure they are super clean). The scoby may sink to the bottom. That is perfectly ok. A new one will form on the top. Cover the jar with the cloth and secure with a rubber band. The cover will let in air, but keep out fruit flies. If you are very handy with sewing, you can sew a cotton cover with an elastic sewn right in. Just be sure that the fabric weave is tight enough to keep fruit flies out, and that the elastic makes a good seal. Fruit flies will lay eggs in the kombucha if given the chance, and then the brew will be full of tiny little fruit fly baby worms….disgusting. Keep everything very clean and sealed to prevent this. Excellent sanitation practices are vital when brewing your own kombucha. Put the jar in a warm area of the kitchen, at least a few feet away from the stove and/or any other fermenting items. Sometimes I cover the entire jar with a cloth, just to hide it. Let the kombucha sit on the counter for approximately 2 weeks. If the brew is only one week, the kombucha will be sweeter. If it is left for a month, it will be tart and vinegar-y. Experiment and decide what you like. Timing is approximate (like many calculations in kombucha brewing). Decant most of the kombucha into small mason jars, so each jar is about 2/3 full. Leave the scoby aside with 1 cup of kombucha for the next batch. Fill some of the remaining room in each small jar with fruit juice or other sweet flavouring. Be sure to leave 1/2” of air at the top of the jar. Tighten the lid of each small jar very tight. Leave the small jars on the counter for approximately 3 days. Place the small jars in the fridge to chill. The small jars should now be slightly carbonated, and should fizz like soda when opened :) (if they don’t fizz, it is ok, just tighten the jars more tightly next time. If your house is cool, you may have to leave the closed jars on the counter for up to a week). Always inspect your homemade kombucha thoroughly. Do not consume the kombucha if there are any signs of contamination, including mould or insects. When in doubt, throw it out (scoby and all). Print out these instructions and keep them on your fridge or beside your batch of kombucha! These instructions are for 1 gallon of homemade kombucha. The recipe can be sized up or down if you have a smaller/larger container. Note that ingredient volumes are an approximate guideline, but you can change it up later on. If the scoby is healthy, and your workspace and supplies are sanitized, the kombucha should be healthy. The scoby should never have mould on it. A new scoby should form on the top of the brew during each batch (or the existing scoby will become thicker as the brew ages). 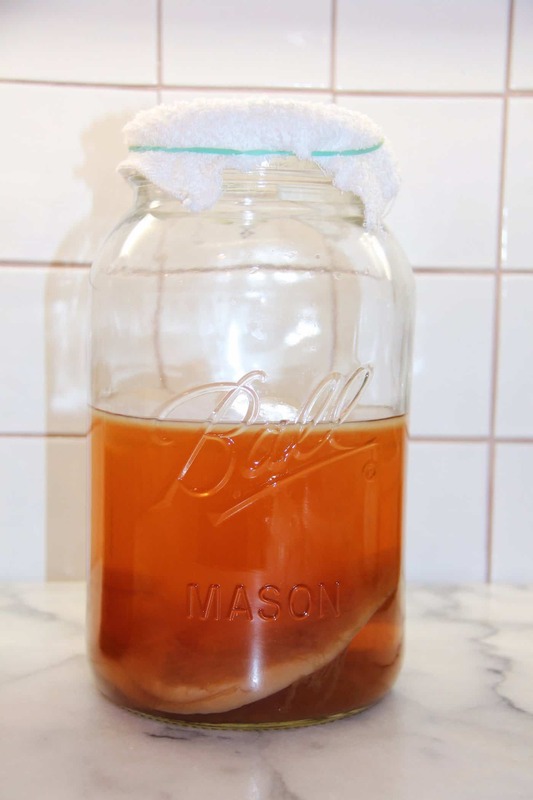 If you ever observe signs of mould on your scoby, throw out the kombucha and scoby, sanitize absolutely everything, and start again from scratch. The scoby should never be frozen, boiled, or left in a hot environment such as direct sunlight. Room temperature (out of direct sunlight) is best. Refrigeration is ok if the fridge is on a warmer setting. 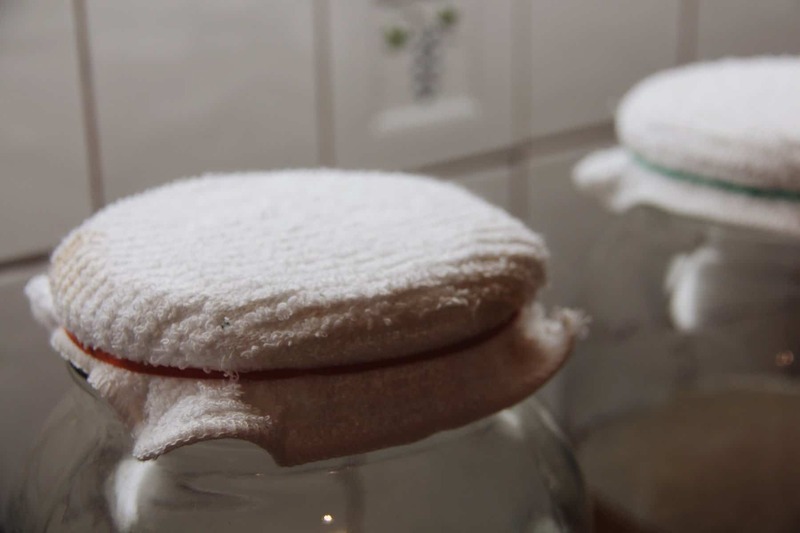 If things sometimes freeze on shelves of your fridge, it is probably too cold for scoby storage. Extra scobys can be stored in another jar on the counter with a bit of kombucha and a touch of new sweet tea (a scoby hotel!). Kombucha does contain a slight amount of alcohol, which is created during the fermentation process. This amount is apparently close to 0.5%, although I have never measured my own. The amount likely varies between batches when made at home. Even though you add a lot of sugar at the beginning, the finished kombucha is very low in sugar. 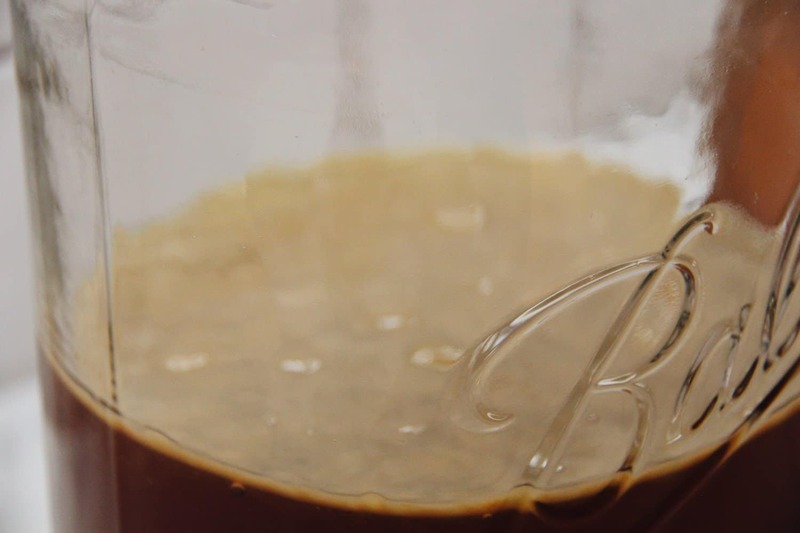 The scoby feeds on the sugar, resulting in a low-sugar beverage. According to the lady who taught me to brew kombucha, the scoby apparently does not like steel. I have not yet investigated the underlying reasoning for this, but I do try to use plastic, silicone, or glass whenever handling the scoby. Kombucha makes a great replacement for pop/cola. I love pop, but am generally happy to have a kombucha instead. Do you have unanswered questions about kombucha? 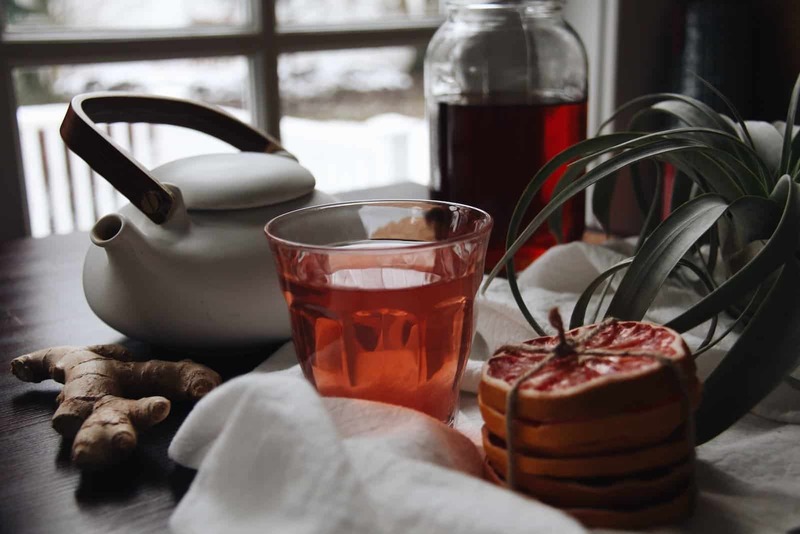 If you’d like a bit more background information on kombucha, check out this post over at MKLibrary, which goes into detail about the actual composition of kombucha as well as some potential health benefits. Previous Post: « What are Garlic Scapes? Wow! Incredible instructions Mary Jane – thank you so much :) I’ve bought Kombucha from the stores and always love the ginger tang of the flavour…once I got used to the stringy bits, it’s now become a huge favourite pop replacement for me – and thanks to you – I know how to make it now – WOO HOO! I’ll let you know how it goes. That’s so great! Let me know how it goes. I wrote these instructions rather quickly, and would like to update them to make it more clear for those new to brewing. If you have any questions or things I can clarify, please let me know and I’ll update them. I also wrote some instructions at some point about how to grow a scoby from store-bought kombucha. Let me know if you can’t find a scoby from anyone, and I’ll dig those up. Best of luck! That’s wonderful! It’s such a neat beverage to try out. If you’ve never had it before, I’d recommend not shaking it before you drink it. There are some stringy bits in kombucha which can look a bit off-putting. They are not dangerous or anything…they can just look a bit gross at first. They usually settle to the bottom, which makes it easy to avoid pouring them out if you don’t shake the bottle. It would also probably be good to limit to no more than a single cup on the first day, to ensure it agrees with you. Good luck! I love that you posted this! I always go to the grocery store and I’m always so sad because the Kombucha is way too pricey to splurge on large quantities. So glad that this post is helpful! It’s true…kombucha at the store is crazy expensive. Fortunately it’s actually fun to do yourself once you get the hang of it. Thanks so much for stopping by! I’m going to try this because I sure do spend a lot on store brands. That’s great! I also spent a ton at the store before I learnt this. Let me know if you have any questions while you’re starting, and I’ll help you and update this post :) Thanks so much for visiting my blog, and good luck brewing your own kombucha! Have heard so much about this drink. Thanks for putting this lovely post together. I LOVE THIS! I will definitely try now that I have this easy recipe. I’m so glad you liked this recipe! Have a great time brewing! Wow I’m impressed! I dont think I’m willing to risk making my own… wanna drop some by my place? lol Gotta love that stuff though! I have faith in you :) it’s actually fairly forgiving…and if it doesn’t work…you can just start again :) If you do give it a go, please let me know if you have any questions! Thanks so much for stopping by.